Star Wars: LEGO: Celebration Exclusives! Today the official LEGO twitter feed posted photos of two new Star Wars buildable figures to be unveiled at Celebration this weekend. If you remember two exclusive buildable figures were revealed at Toy Fair New York back in February: the Darth Vader and Luke Skywalker sets. The two exclusive buildable figure images shown today were of General Grievous and Obi-Wan Kenobi; they are two of four to be exclusively unveiled at Star Wars Celebration this Thursday! The other two to be shown off during the LEGO panel are Commander Cody and Jango Fett, so that’s six great new LEGO sets to look forward to this year. The release date for these buildable figures is September, along with all The Force Awakens sets! 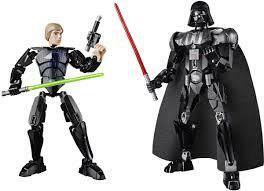 To take a look at the General Grievous and Obi-Wan figures click here.